Tourism Matters | News | Opinion | Discussion | Advice | Innovation | Development: Golfers Clear Argyll Water Hazard! 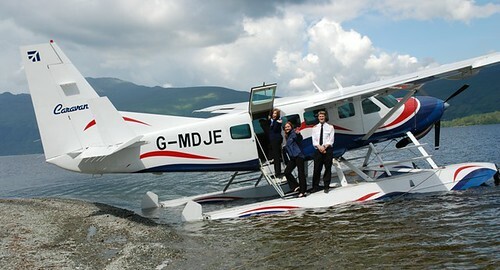 Interesting article in the For Argyll website introducing Golf Links Express an offshoot of the award-winning Loch Lomond Seaplanes business which will offer golfers a 20 minute seaplane flight to some of Argyll’s spectacular golf courses from prestwick International Airport. As one with memories of the golf tourism potential of linking Ayrshire, Argyll and Antrim by ferry the new route is more than interesting. In the mid nineties Celtic Links developed packges in conjunction with Argyll and Antrim Steam Packet company which created three or four centre golf breaks with joined up sailings between Ballycastle and Campbeltown, Argyll and Arran, Arran and Ayrshire and Troon to Belfast with the old Seacat. So the idea that these can be linked by air shows great promise for this niche golf market for sure. David West, from Loch Lomond Seaplanes, puts the logic of the development and paints an enticing picture. He says: ‘Prestwick International Airport already welcomes tens of thousands of golfers every year but many rarely venture further than Ayrshire because of the travel time by road. Now they can access some of the best links courses in the world within minutes. Golf Links Express will be able to carry up to 10 golfers and their clubs from Prestwick to Islay in around 25 minutes, on to Machrihanish in 15 minutes then to Loch Lomond in another 25 minutes. That’s three fantastic locations across Scotland (and all in Argyll). Each would usually take a day’s travel to reach by car. ‘We’ve already had bookings from golfers as far a field as the US, Scandinavia and Ireland,” said David West, founder of both Loch Lomond Seaplanes and Golf Links Express’. Jim Mather, Scottish Tourism Minister was quoted, ‘Having seen the setting up and launch of the Machrihanish Dunes resort I am delighted to see that the potential realised for expanding the golfing appeal of Kintyre and of Islay by providing an air ferry service based on Prestwick, another of Scotland’s golf attractions. ‘As David West of Loch Lomond Seaplanes has said, the new Machrihanish Dunes course and the historic Machrihanish Course are but a short hop of twenty minutes away from Prestwick. The beautiful Machrie course on Islay, known only to true aficionados, is less than ten minutes on and for those who really want to extend the golf experience there are superb courses accessible in Northern Ireland 25 minutes flying time from Kintyre. It will be obvious that this could set up a wonderful opportunity for golfers to mix and match and that all the courses could enjoy an increased footprint as a result.